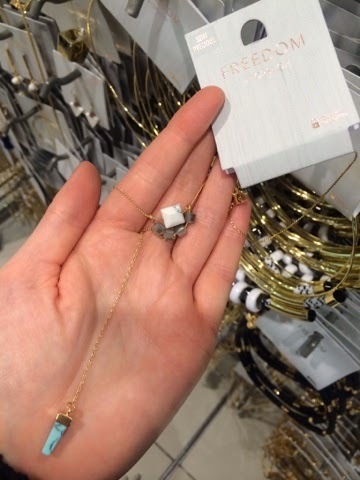 I'm really picky with jewellery so I rarely buy it, there was a point maybe 10 years ago when ASOS was an absolute treasure trove for me but I feel like I have to look a little harder these days. I also think when I was in my late teens bling was definitely more tacky than current (RiRi has much to answer for! ), so I remember abundant jewellery not being so much a thing. 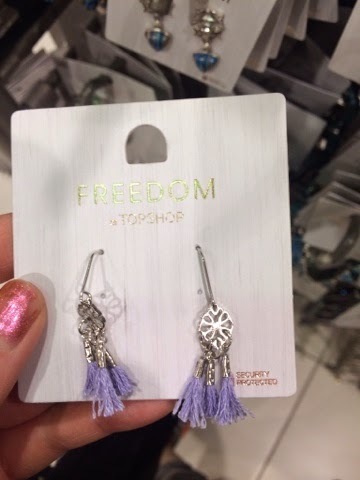 If anything it was boho, feather necklaces and earrings etc (which have come full circle but now they come under 'tribal', 'traveller' or 'gap year' style fashion). 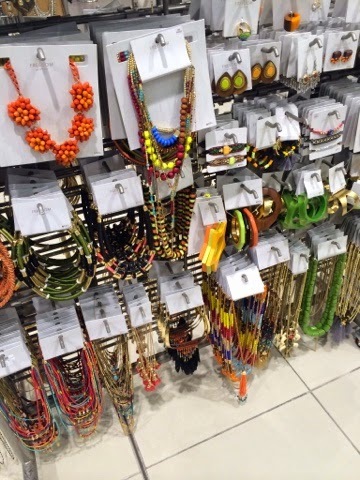 So typically I always found my best jewellery either abroad, at vintage fairs or on specialist boutique sites, where you could source something a little bit different and special. 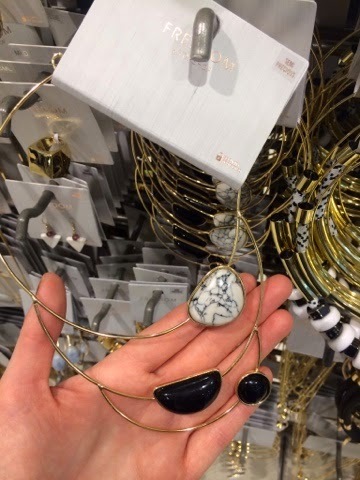 I've always found a piece or two at Topshop which takes my fancy, especially the Orelia range, but I got a bit fed up with their pieces aaaalways breaking or fading after about 2 wears. 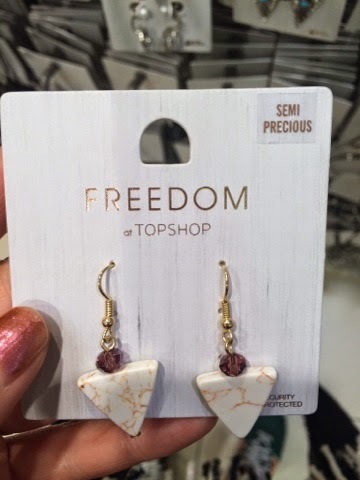 I'd expect that from Primark maybe but always thought Topshop represented better quality than your average high street brand. 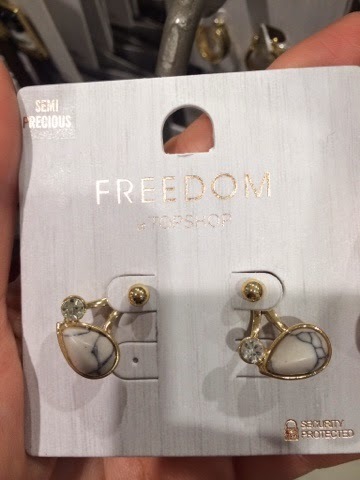 However, recently their Freedom range has been absolutely knocking it out of the park. I know they have rebranded it in the classy off-white packaging, which did attract me in the first place (I'm a marketer's dream), but it really seems like they have upped their game in the quality of the pieces too. 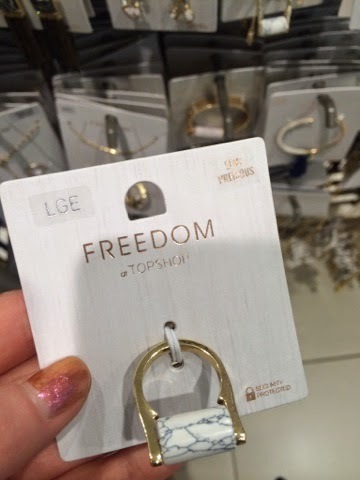 Walking around the Freedom section is a real treat now, I always make sure to pop in see what's on offer when I'm passing and especially when payday is far from imminent. You can get a really lovely piece for a fiver and still feel like you've treated yourself. I embarked on such a sojourn around this section of the store today and literally, every stand was full of items I was going crazy for. 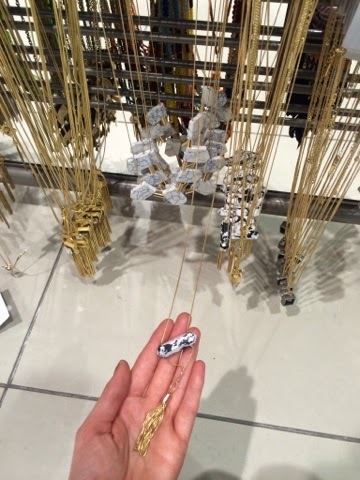 I couldn't tear myself away! 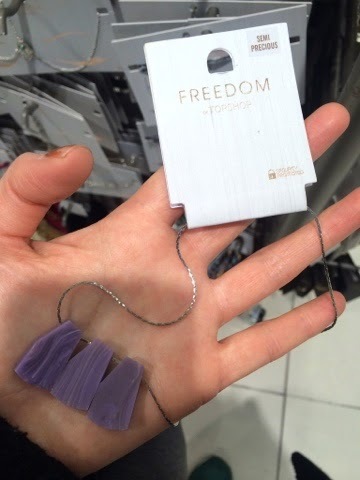 Love this marbled off-white semi precious stone range, the shape is interesting and the purple glass beads really set it off. 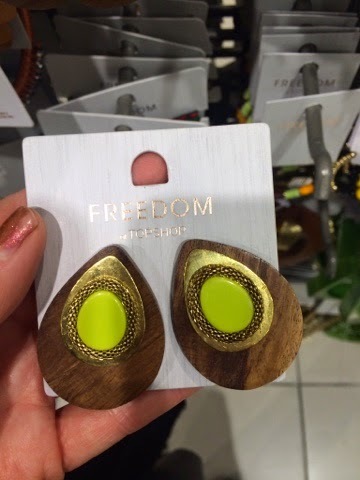 I have these ones in gold with green tassels! I ummed and ahhed for a stupidly long time over the two the last time I was in there. They have that lovely ethnic look and could really be worn both casually and dressy. I love the combination of the silver metal and purple tasselling. This is a similar colour scheme to above which really seems to be catching my eye, they're almost African looking and so glamorous, I love the black stone at the top giving them that extra edge. Well I think it's clear I'm a fan of the silver and purple! This could so easily pep up a plain top and I just picture it with a nice plain shirt or Poloneck for work. 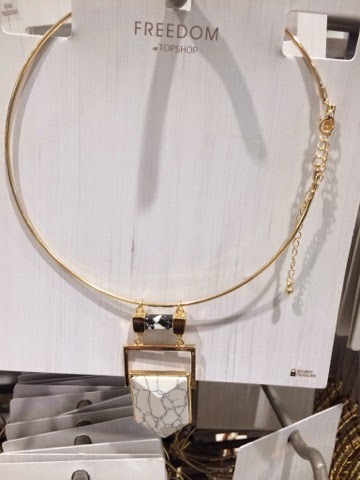 The fine chain is really delicate and looks lovely against the interesting architectural pendant, which stands out as a directional piece that is nevertheless really accessible. These are just to die for. 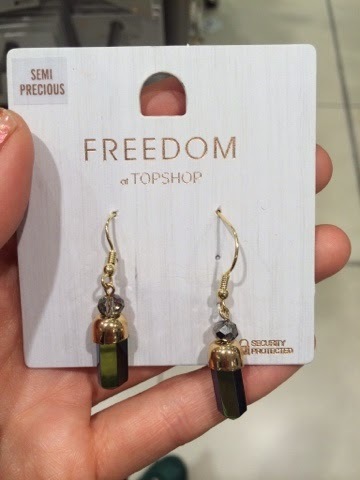 I love glamorous drop earrings but only when they're beautiful enough to warrant grabbing so much attention. These definitely are. 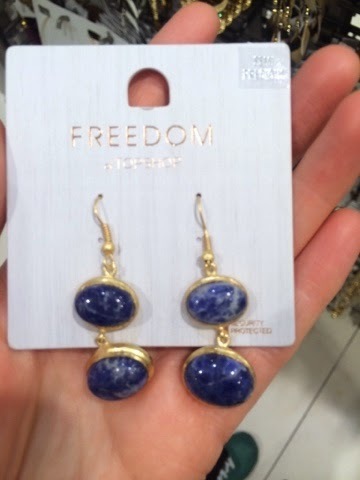 The azure semi precious stone is gorgeous and just recalls a dazzling constellation hanging from your ears...ok I'll quit with the Patrick Moore now (unless you prefer Brian Cox?). This is a stunning accompaniment to the earrings above. 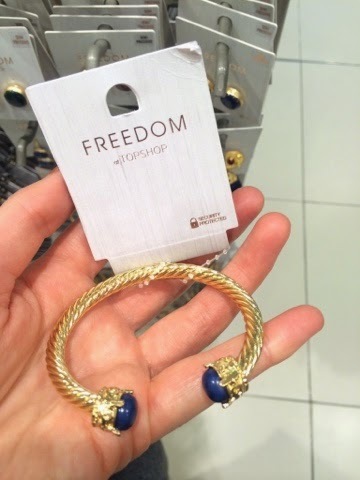 Cuff bracelets are a weakness of mine and the roped gold is very Grecian, with that perfect azure colour again that always marries sooo well with gold. Now these I'm not sure I could get away with, but they really caught my eye and I could see them looking incredible with a tribal printed top. Love the contrast of lime green and oakwood. 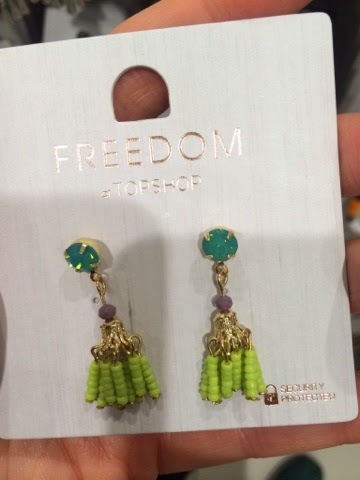 These are another variation on the little ethnic tasselled earrings that I saw quite a few of. Purple and green always stand out to me, set against the gold they just make you want to book a holiday and put together a perfect jewel-coloured capsule wardrobe. So cute. Love the colours, all the stands are always curated so well - they really know what looks good and forms the most perfect visual tableau. Another of these beautiful off-white marbled stones, this doorknocker style of ring can be overdone but this looks really luxurious for not much over a fiver. Same stone as above with the lovely touch of the just-the-right-amount-of-delicate diamanté. I'm a big fan of these double-ended studs which have started creeping in everywhere. Yet another of these stones and these are so original. Very structural and almost minimalist, but really pack a punch with the thick drop section. 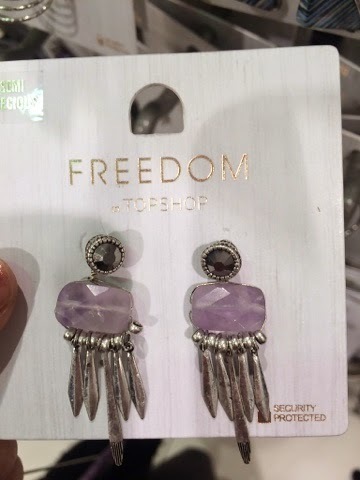 These could make any outfit. A lovely double pendant with fine chain and summer-worthy topaz stone. The middle section is so interesting too. Could see this looking lovely with just a simple low-cut tee or silk vest. Standout architectural bracelet with those lovely semi precious stones again. This is just begging to be paired with a tan (and a cocktail). Beautiful abstract collar style in a very mature monochrome palette. This would look great on literally any age, with a perfect white shirt or bandeau/sweetheart-neckline little black dress. I do love me some of those tassels! 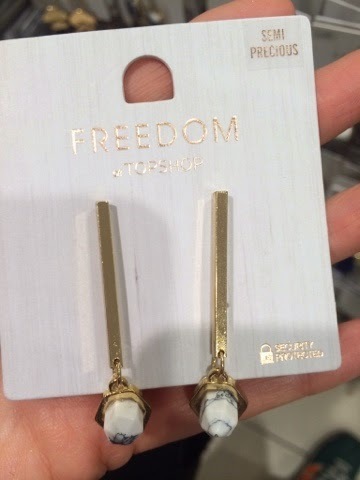 This is a more grown-up version with the tassel in metal, and the gold and white colour palette just screams 'resortwear'. 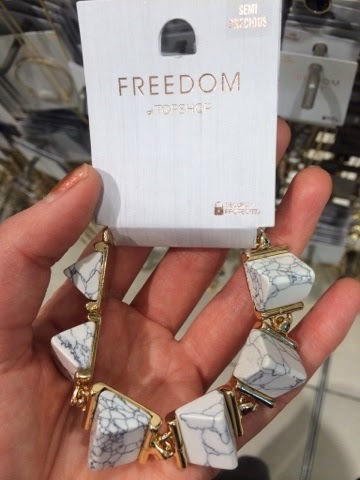 Another incredible collar necklace with the clearly popular off-white marbled semi previous stone and triangular shape, which looks great against the perfectly round main section. These were perhaps the most unique among the range as these lovely rainbow stones were the only ones I saw of their kind - it was hard to capture but they changed colour when you moved them around in the light. Sometimes you just want a daintier drop earring when oversized is just too much - these would instantly make any look seem more high-end. Last but not least, a lovely bangle piece in this muted but beautiful pale blue shade. Definitely needs pairing with a blindingly white summer dress or cutoff Levis and white tee/70s-style gypsy top. Now I'm more convinced than ever that I need every single one of these pieces! How could I possibly decide between them? 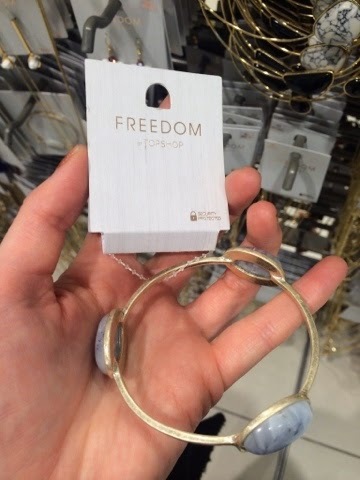 What do you think of Freedom, is it already a faithful go-to for you or might this article inspire you to go check out the latest range?